With up to 4 E1/T1 digital trunks, MX100E series Digital Media Gateway supports varieties of protocols and codecs, including SIP, ISDN PRI, G.711, G.729A, G.723, iLBC, GSM, and G.168, T.30, and T.38. 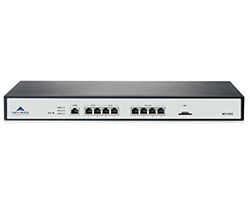 It connects E1/T1-based PBX and PSTN to IP telephony networks. It is packaged in a 1U chassis.